Hubbard Fellowship Blog – Mummy Wasp! How many naturalists does it take to spot a parasitoid? In this case, two. While we were harvesting seeds in a wet prairie, Chris spotted this caterpillar. He noted that it seemed to be mimicking horsetail (Equisteum sp. ), a very common wetland plant, for camouflage. That was a really interesting idea, but it turns out be far from the truth, and you’ll soon see why. 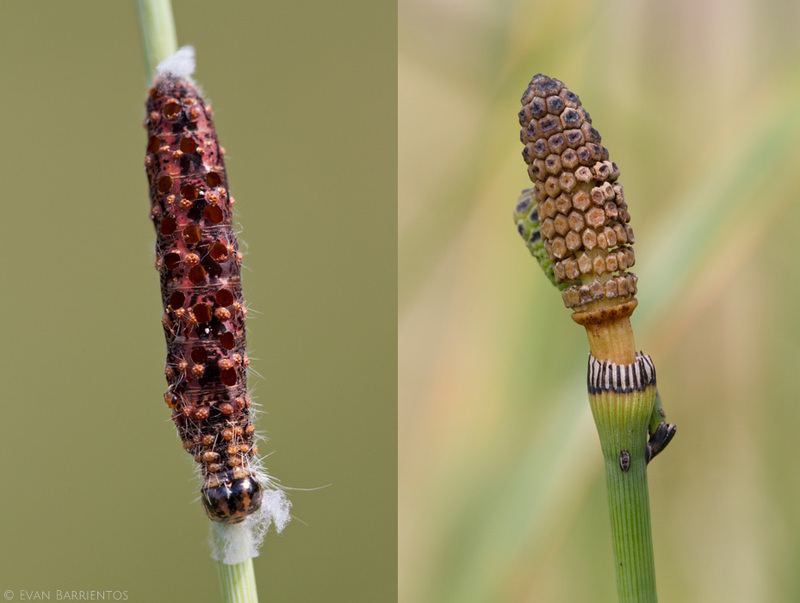 At first it seemed that this caterpillar was mimicking horsetail (Equisteum sp. ), but can you spot the real culprit of this caterpillar’s odd appearance? Upon a closer look, I noticed that the caterpillar was honeycombed with holes. This caterpillar wasn’t using camouflage; it had been parasitized! Did you know that there are forty to fifty thousand species of wasps so small that they are almost invisible to the naked eye? They are called Braconid wasps, and they have a fascinating life cycle. Nearly all Braconids lay their eggs on or inside another insect (called a host), which are often caterpillars. After the eggs hatch, the wasp larvae eat the host’s insides, pupate (turn into adults) inside the body, and chew their way out as full grown wasps! Insects that do this are called parasitoids. While I was taking photos of the dead caterpillar, Chris made an even better observation: there was one last wasp still emerging from it!!! A Braconid wasp emerges from its caterpillar host. Keep reading to learn exactly what species they are. It was awesome to witness and document a Brachonid wasp in action, but I wanted to go further: I wanted to know what species these two insects were. As a naturalist, I love learning about tiny and obscure organisms like this wasp. It just blows my mind that so much information exists about such unappreciated species if you can only identify them. When you learn a species’s name, it goes from a speck to an encyclopedia. So I posted this photo to Bugguide.net and an incredible entomologist (insect scientist) suggested that this might be a Stigmata Mummy Wasp (Aleiodes stigmator) feeding on a Cattail Caterpillar (Simyra insularis). I did a little more research and found this publication on Aleiodes wasps. I learned that as Aleiodes larva go about eating their host, they line the caterpillar’s insides with a light silk. Eventually, the caterpillar dies and shrivels up, which is why the wasps are called “mummy wasps.” Aleiodes larvae chew a hole through their host and secrete a substance that glues it in place while they finish eating and pupating. Eventually, they chew their way out of the host and emerge as adult wasps. If this all sounds gross to you, at least consider that mummy wasps and countless other Brachonids are important pest predators. Mummy wasps help keep gypsy moth and tent caterpillars in check, and several species of parasitoid wasps are sold to protect crops ranging from corn to tomatoes. It turns out that each Aleiodes species makes a unique mummy. I went through the pictures in the publication I was reading and found one mummy that closely resembled my specimen (described as “appearing as though pelted evenly by shotgun pellets”). Sure enough, the guide listed the wasp as Aleiodes stigmator and the caterpillar as Simyra insularis! From there I learned that A. stigmator is the oldest known Aleiodes in North America and was discovered by the first American entomologist, Thomas Say, in 1824. Say thought the wasps’ exit holes looked like stigmata in the hands and feet of Christ, and so named the species “stigmator.” Despite having been discovered long ago, this species has never been carefully studied and many basic facts about it are still unknown. When you look at the holes in this caterpillar, do you think of the stigmata on the hands and feet of Christ? I sure didn’t, but the entomologist who discovered this wasp somehow did. I don’t know what’s more amazing, wasps that eat their way out of caterpillars or people who can identify them from a single photo. It never ceases to astound me how every living speck of an organism has such an interesting story behind it. This process of stumbling upon mysteries and discovering their secrets is a large part of what drives me to spend so much time exploring nature. There’s just so much coolness out there! This entry was posted in Hubbard Fellowship, Prairie Insects, Prairie Natural History and tagged Aleiodes stigmata, Braconid wasp, Cattail Caterpillar Moth, Parisitoid, Simyra insularis, Stigmata Mummy Wasp by Evan Barrientos. Bookmark the permalink. Fascinating!! I forwarded this blog on my facebook. Should have saved this for Halloween Evan! Those little wasps are kings. Just imagine if they did not exist. I have seen the result of unconstrained reproduction of tent caterpillars. It looks like total devastation. Good golly! What fascinating information and incredible pictures! Thank you for sharing such great information with us.